When you wake up the first thing you must do is talk to Your Heavenly Father. He always speaks, and you do not want to miss anything important that He has to say. He has spoken in three different ways to me this week. He told me that through my worship He will elevate me and take me to higher heights. I say amen to that, and I believe Him no matter what. Then the enemy spoke to me through a loved one and said that it’s not all about church, everybody prays. My loved one said what matters is your job, getting your own place, making money, living comfortably basically. to listen, and to just pray for His peace to rest upon my loved one, and so I did, but through it all I stayed silent. I choose to listen to God’s voice no matter what, and since doing so I’ve seen how faithful my God is. He spoke and he said I’m capable of leading worship more often. He pretty much said I’m more capable than I think I am. It’s just a case of believing Him, that indeed I am capable because He said so. Ok so then I wake up this morning and He says renew a right spirit. He is basically saying in order for me to worship Him in truth my spirit must always be right, and clean before Him. Which means I must die to self on a daily basis. Which means I must choose Him over everything on a daily basis. Which means I must listen to His voice, and wait on Him in every situation. Even if someone offends me, I must not retaliate unless of course He permits me to do so, and that would be in love. I guess that’s what turning the other cheek really means. To wait on Him, and let Him handle it. And trust me there are things that I would just love to handle in my own way. But He says vengeance is His, and when vengeance is The Lord’s trust me He doesn’t play. So after He says renew a right spirit, He then takes me to a scripture about testing His Spirit. He says we must not test His Spirit. Testing His Spirit is choosing to believe in the flesh, and the spirit at the same time it doesn’t work like that. We must choose to believe Him no matter what. We cannot agree with the flesh and the spirit. We must agree with His Spirit alone. If He says yes then it’s yes no matter what, and if He says no, then it’s no, no matter what. He then reveals to me in the very same scripture the ministry that He has been prompting me to go into, and I just laugh and smile. So far The Lord hasn’t specifically spoken to me about going into the exact career as what I studied, computer science. However, there has been an opportunity to go into a total different career choice that has completely nothing to do with computing lol. Because it’s so different from what I studied, I cannot lie that I’m a bit scared of saying I’m gonna go for it. But He has already given me somewhat of a vision of the direction in which He wants me to use this career for, and it seems amazing. So I just choose to believe Him no matter what. There are far too many examples in the bible where God changed the careers of His children into what He believed they were capable of doing. Moses was the prince of Egypt for many years, until God changed his career into becoming the leader of the Hebrews. David was a shepherd boy, until God changed his career into becoming a giant slayer, and a king. Peter was a fisherman, until God changed his career to becoming a fisher of men. There are far too many examples of when God showed up and brought a changed amongst the lives of His children. We have just got to believe Him no matter what. If He has given you more than one vision then it’s because He believes you are capable of carrying out those visions. We must not be afraid of change, because when He shows up He brings forth a change. He shifts us into His direction. When He shows up He shifts us into His perfect predestined will, if only we choose to believe Him. Remember Joseph had a vision. Joseph had a dream, the dream seemed outrageous to his family, but Joseph chose to believe God. Joseph went from seeing a great vision to being in a bottomless pit. Joseph could of questioned God. He could of said why would God reveal this to me, yet look at where I am? Joseph could of questioned whether the vision was really from God or if it was just his imagination, wishful thinking. But God did reveal this great vision to Joseph and guess what He never stopped revealing to Joseph until the vision became a reality. The vision would have never become a reality if Joseph had not chosen to believe God no matter what. Listen when God gives a man vision, He will surely make provision! I didn’t know God was gonna take me into this message, lol. You see God gave Joseph a vision but he ended up in a bottomless pit. But because of the perfect predestined will of God, Joseph found favour in the king’s palace. But then Joseph went from being in the palace to being in prison. I don’t know if anyone can identify themselves with Joseph the dreamer. Listen when God gives you a vision challenges will arise, but just because challenges arise does not mean the vision is not from God. If you choose to not believe the vision then the vision will never become a reality. Are you seeing great visions even at the place that you are right now? Or have you just given up because of current circumstances? Listen we must silence the irrelevant voices around us. Silence the voice of the enemy. Yes challenges will arise, but if the vision is of God tell me who can stand against it?! It is only The Lord who can make the dream, the vision become a reality. So we might as well stick to His plan no matter what. And Joseph went out from Pharaoh’s presence and traveled throughout Egypt. I see the vision and I choose to believe in this vision no matter what, even at the place that I am right now. I refuse to be afraid of change. God change whatever You want to change. You are the author of my life, You know the end of my story. I thank You for revealing Your vision. I trust You in the bottomless pit. I trust You in the king’s palace. I trust You in the prison. I believe You have taken me to higher heights. Wherever I go ,I go with You. I overcome challenges because of You. I will not give up until the vision becomes a reality. Interrupt my life whenever You want to Lord. I know with You I will never remain in the same place forever. Every trial is but for a season. Weeping may endure for a night, but joy surely comes in the morning. In You oh Lord I put my trust. It doesn’t matter if nobody else sees it, as long as You do that’s all that matters. I believe that you will bring destiny helpers my way, those that believe in the vision that You have for my life. I will worship You no matter what. I will worship You in the good, even in the bad I choose to worship You. I refuse to give the enemy the chance to throw me of course. I will win this race, oh yes I will win this race! For I know with You I Can Make It! I stick to Your plan Lord. The most important plan of my life is Your vision. I trust You no matter what. My comfort zone is my flesh. I cannot do anything by relying on my flesh. I can only do all things through Christ who strengthens me. So I step out of my flesh and into His Spirit, and I seek His guidance and direction. When God uses you, He uses you way out of Your comfort zone. Where we must have total reliance on His Spirit. Our feet may fail, but His Spirit never fails! How many of us knows that joseph was taken away from his comfort zone? Yes joseph was taken away from his loved ones, all the way to Egypt the great unknown, the unfamiliar. If you want God to use you be prepared to go to the great unknown. Be prepared to be taken away from your family and your friends. Be prepared to pick up your cross, be prepared to die to self. For there is no familiarity with God, and that’s the reality. And even in the unknown God is there. If we want God to use us, then we must be prepared to leave and go into the unknown. Just like God was there with joseph in the bottomless pit. Just like God was there with Joseph in the prison. For He will surely take care of you. No matter what may come your way. Just choose to believe God Almighty, no matter what. For when He shows up, He shows up, and He pulls us out from the gutter into greatness. How do I know if the vision is from God or not? Well if God keeps prompting you. That’s His perfect predestined will for your life. The more challenges you overcome the higher He will take you. Believe what He shows you. Do not be afraid to be like Joseph the Great Dreamer. 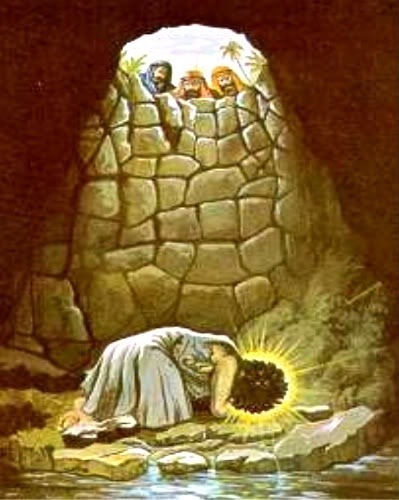 For God has the power to take you out from the bottomless pit. Sammy, I know I met you on twitter and don’t know you personally but, I choose to believe God for you. One thing I know, He does not conceive little dreams and the path to their realization isn’t always smooth, but does He always bring it to pass? Yes! Friends and family, and sometimes fellow christians may not always understand, but did the crowd that shadowed the woman with the issue of blood understand? No. Did her faith and complete trust in God bear fruit? Very much, it did. I say we continue to trust God, rely on Him; even if the path seems steep; everything is not usually what they seem to be. God is faithful and He’ll always deliver…on His Words.